Meyer C, Bredow J, Heising E, Eysel P, Müller LP, Stein G. Rheumatoid Arthritis Affecting the Upper Cervical Spine: Biomechanical Assessment of the Stabilizing Ligaments. Biomed Res Int. 2017;2017:1-7. Read – Turmeric and Curcumin Benefits on Arthritis? 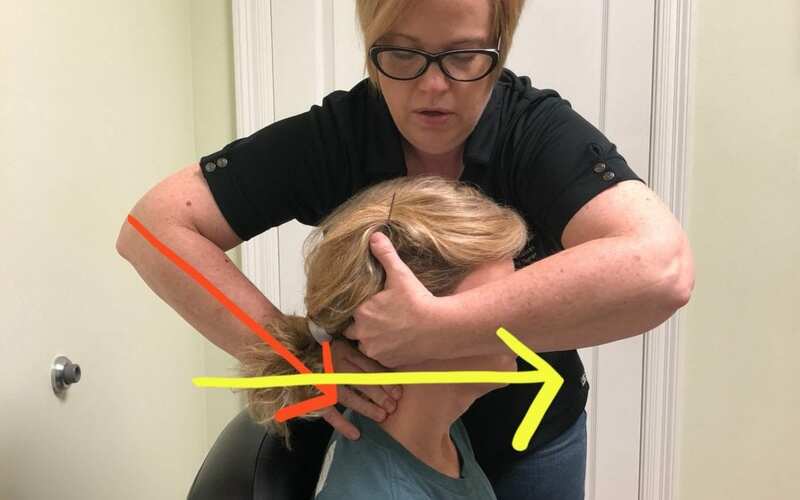 This study was performed to determine the stabilizing values of the upper cervical ligaments in order to evaluate their contribution to protection of the neurological structures in this area. Ten frozen specimens with an average age of 84.6 years old were analyzed from C0 – T1. It was determined that 30N of force was needed to perform normal, age-related ROM (40˚ of flexion to 50˚ of extension). Testing was performed moving from flexion to extension 3 times prior to beginning the experiment to decrease any viscoelastic properties that could cause bias. The specimens were then moved in 3 different phases: (1) Flexion/extension performed with intact ligaments, (2) flexion/extension after the transverse ligament (figure 2) was resected, (3) flexion/extension after the alar ligament (figure 2) was resected. Sagittal fluoroscopy was performed capturing images in end-range flexion and extension as well as neutral position. Table 1: Changes in AADI and PADI in neutral, flexion and extension with intact ligaments and after transverse and alar ligaments have been cut. 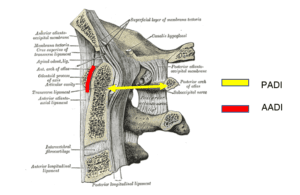 This study supports previous findings indicating that the position of the odontoid process is related to the laxity of both the TLA and alar ligaments. Rheumatoid arthritis can cause ligamentous laxity and bony instability due to the inflammation process and destructive synovitis, which can lead to laxity and bony erosions.12 The potential for ligamentous laxity should be considered when treating the RA population. IAOM Commentary: Treating patients with RA should be approached cautiously. It has been reported that the risk factors for increasing instability and neurologic deficits in the RA population are higher in males versus females.13 Other non-radiological risk factors are prolonged use of corticosteroids, severe peripheral joint changes and a positive rheumatoid factor.12 Attention to detail with the questioning and patient history taking is imperative as health care providers assess this population. Does the patient’s ligamentous laxity correlate with other red flags such as neurological deficits, increased deep tendon reflexes, severe pain, blurred vision and gait disturbances?14 Does the patient present with neurological deficits in addition to other testing. Sizer et al suggested placing patients in one of three different categories according to their individual red flags.14 Category I requires the patient to be referred back to the physician. This category would include the patient with cord compression (bowel/bladder changes, saddle anesthesia etc) as well as those who need imaging according to the NEXUS or the Canadian Cervical Spine Rules. Category II requires further questioning, testing and cautious treatment and watchful waiting.15 The RA population would be considered in this category with the assessing of the transverse and alar ligaments without neurological deficits. Category III requires extra testing clinically and clinical reasoning to further identify the patient’s pain generator. Figure 3: Alar Ligament Testing: C2 segment is stabilized in a ventral-caudal direction. 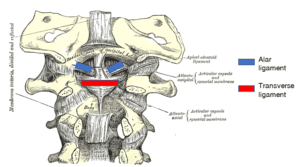 The examiner then performs an axial distraction through the occiput in order to tighten up the alar ligaments. The head is then sidebent away from the examiner while there is remaining pressure on the side of the C2 lamina closest to the examiner. No movement of the spinous process should occur if the ligaments are intact. Figure 4: Transverse Ligament Testing. A. Stabilize the C2 segment with a ventral-caudal stabilization. The therapist then performs a ventral glide with the occiput and C1. B. Stabilize the C2 segment as before and the therapist performs a sideglide of the occiput and C1 towards the clinician. A positive test is one in which the patient’s symptoms are reproduced. 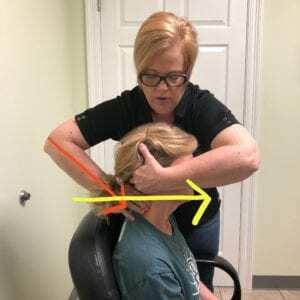 As Physical Therapists become the first line of defense in a patient’s medical treatment, they should be mindful of changes that are occurring in our patient’s bodies, seen and unseen to ensure their utmost safety during treatment. A patient with an alar ligament tear could present with severe neck pain, muscle spasms, dizziness, and tinnitus.16,19,20 A patient with transverse ligament disruption can present with cord symptoms, neurological deficits, gait disturbances and possible difficulty with swallowing.9,16 We should correlate patient’s symptoms and clinical findings as well as watchful waiting, as suggested by Cook et al.15 Good communication with the patient and their entire medical team is imperative in assisting our patients towards recovery as well as seeking further examination for conditions that may be outside our scope of practice. Dreyer SJ, Boden SD. Natural history of rheumatoid arthritis of the cervical spine. Clin Orthop. 1999;(366):98-106. Hacking C. Atlantodental interval | Radiology Reference Article | Radiopaedia.org. Radiopaedia. https://radiopaedia.org/articles/atlantodental-interval. Accessed May 6, 2018. Reiter MF, Boden SD. Inflammatory disorders of the cervical spine. Spine. 1998;23(24):2755-2766. Boden SD, Dodge LD, Bohlman HH, Rechtine GR. Rheumatoid arthritis of the cervical spine. A long-term analysis with predictors of paralysis and recovery. J Bone Joint Surg Am. 1993;75(9):1282-1297. Panjabi MM, Crisco JJ, Lydon C, Dvorak J. The mechanical properties of human alar and transverse ligaments at slow and fast extension rates. Clin Biomech. 1998;13(2):112–120. Winkel D, Aufdemkampe G, Matthijs O, Meijer O, Phelps V. Diagnosis and Treatment of the Spine: Nonoperative Orthopeadic Medicine and Manual Therapy. Austin, Tx: Pro-ed; 1996. Geck MJ, Yoo S, Wang JC. Assessment of cervical ligamentous injury in trauma patients using MRI. J Spinal Disord. 2001;14(5):371-377.